Fathom Five National Marine Park in Ontario, Canada is a pristine and well protected portion of Lake Huron where tourists can visit shipwrecks, historic lighthouses and beautiful beaches. In Big Tub Harbour, the shipwreck, the Sweepstakes can be viewed by scuba diving or aboard a boat tour. A schooner ship which was damaged off Cove Island and then towed to the harbour where it sank into the beautiful blue waters in 1885 before repairs were done. At times, the shipwreck will sit well below the surface of Lake Huron and then when the lake becomes shallower, sections of the Sweepstakes rise up out of the water making parts clearly visible. Throughout Fathom Five National Marine Park, there are 22 shipwrecks and many people come here to snorkel and scuba dive in these pristine waters. 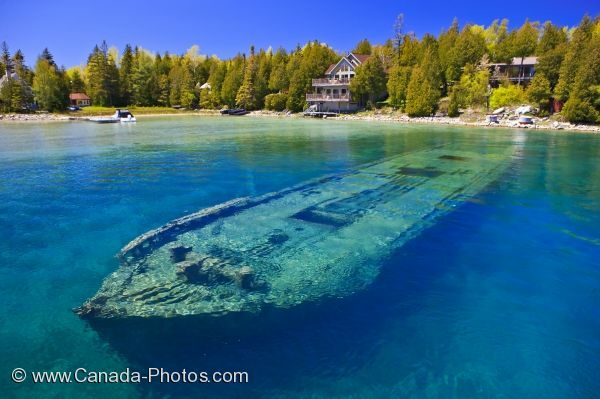 Picture of a shipwreck in Big Tub Harbour in Fathom Five National Marine Park near Tobermory, Ontario in Canada.